With all of the running I’ve been doing lately (~28 mpw!) my carnivorous cave-woman body has started heavily craving meat. A lot of meat. All the meat. *Note: this recipe includes marinating the meat for two days. Sorry procrastinators, you are going to have to plan ahead on this one. Pour the orange, lemon and lime juices into a large (big enough to fit the meat and liquid) plastic bag. Add the garlic and olive oil. Shake the sealed bag a few times to mix it all up. Put it into the plastic bag and seal it, trying to remove any excess air. Place the marinating bag of delicious into the fridge and forget about it for two days. Take the bag out of the fridge and let it warm to room temperature. Remove the steak and salt & pepper each side. Put the heat towards the high side of medium-high. Take the steak off of the skillet and onto a plate. 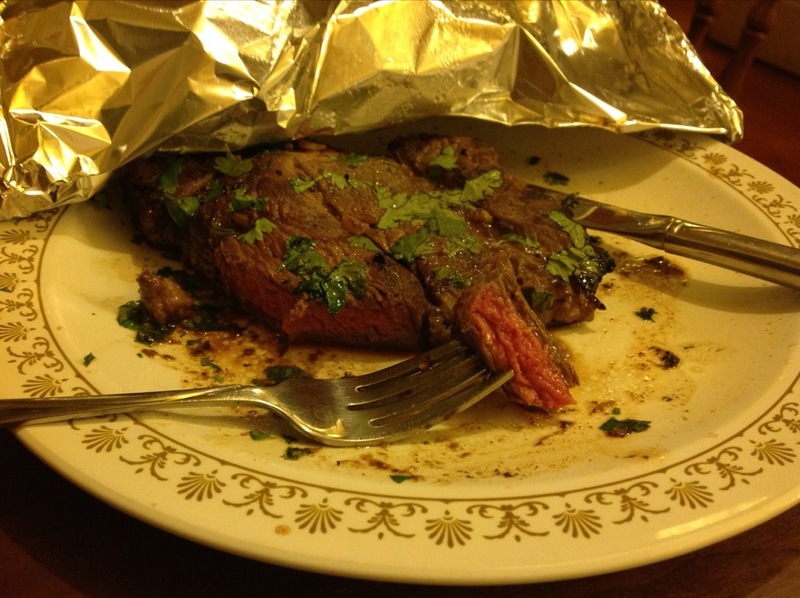 Cover it in the rest of the cilantro, and then cover the plate in aluminum foil. Leave it alone for 10 minutes **. * Want a juicy steak? Only flip it over ONCE. This applies to cooking it on the grill too. Don’t poke it too much either. Both of these things will allow all of the precious juices to escape, which would be a tragedy. ** After cooking a steak don’t immediately cut it. Give it 10 minutes to rest covered on a plate so the juices can settle. If you don’t listen and cut it open early, you will be disappointed in your dry steak, and I will be disappointed in you.